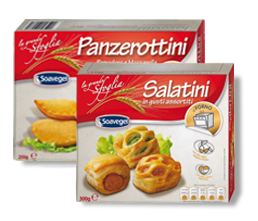 Soavegel srl | Italian Frozen gastronomical specialities. The new line of tasty Snack Baked. 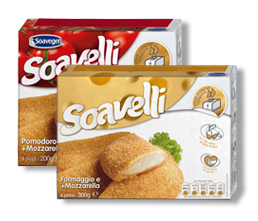 Covering a total surface area of 30.000 mq, Soavegel is equipped with the most contemporary and innovative technological systems. 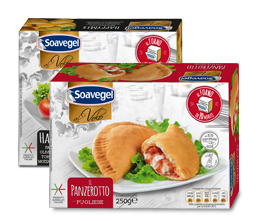 For more than 80 years, Soavegel has engaged in production and deep-freezing of Italian gastronomical specialities. A selection of products with a short cooking time to meet the demands of modern consumer needs. 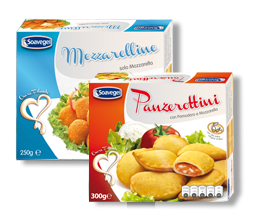 A range of delicious snacks filled with a tasty melting heart of mozzarella cheese. Tasty crispy pancakes with a fine coatings of breadcrumbs to enhance the rich filling. Puff pastry products made with natural ingredients, without lactose and hydrogenated fats.